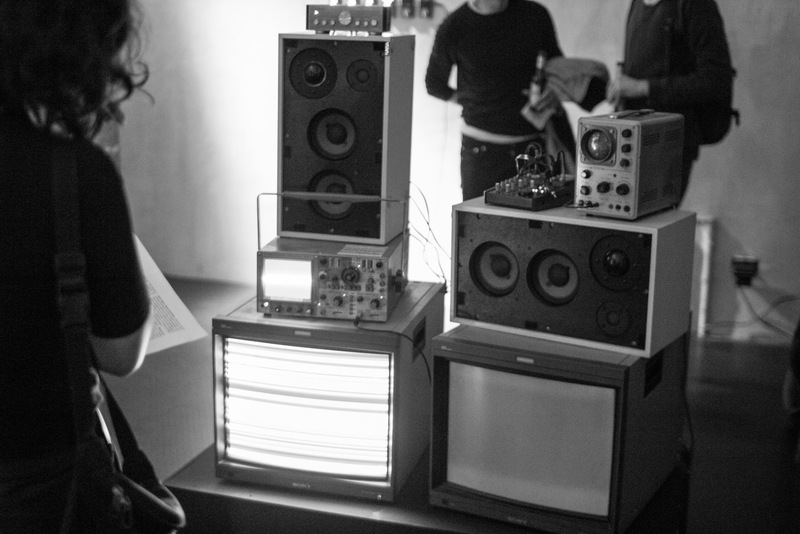 The Electronic Chaos Oracle is an ongoing artistic research with Marcel Schwittlick. It explores generative text systems and plays with the different ideas like - the all knowing A.I. as the new godlike oracle, the dialoge between human an machine and idea of autonomous cognitive systems, that 'live' and converse on their own. 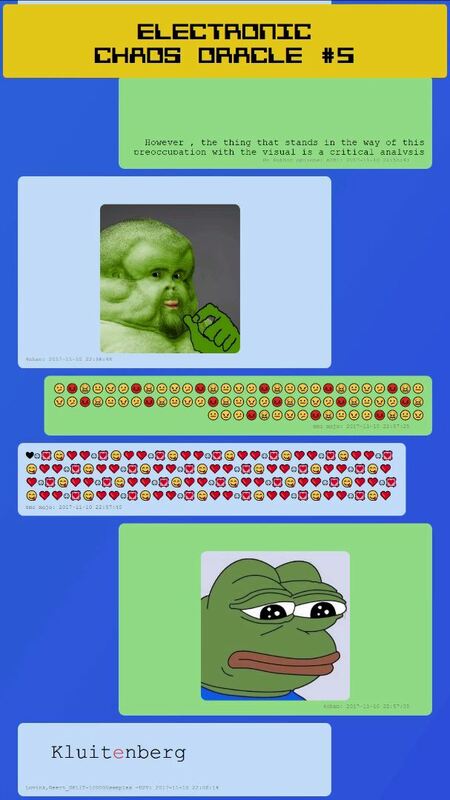 The edition #5 is an augmented machine learning chatroom, generated from millions of statements and images taken from a database of textbooks, 4chan, reddit, gifs and emojis. One main idea behind the project is to close the circle of training machine learning systems. The situation of feeding vast amounts of data in our new machine learning and artificial intelligence systems was lacking the purpose. The Electronic Chaos Oracle’s objective is to give humans the chance to learn from their own data, which was used to train the intelligence behind the installation. 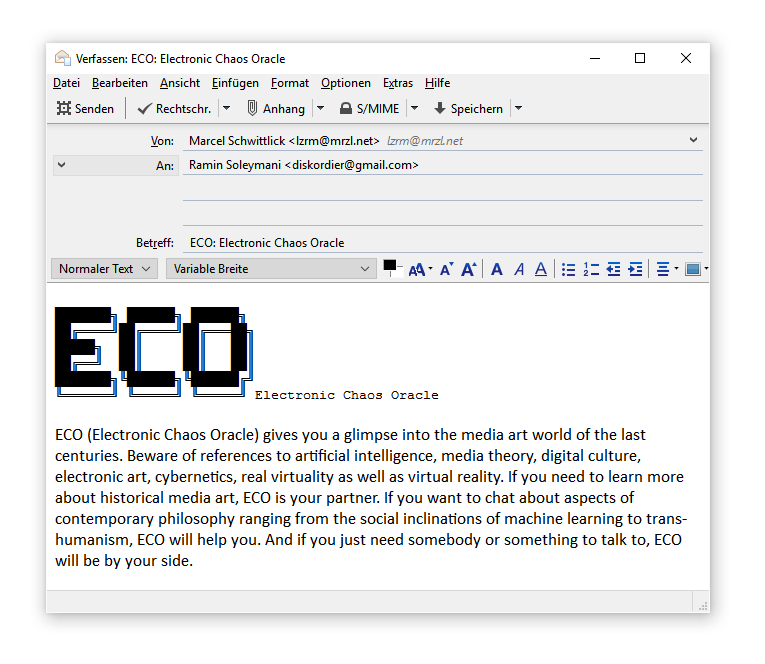 The Electronic Chaos Oracle (ECO) is an interactive installation and an embodiment of an ancient oracle in the computer age. With ECO you can collaboratively co-author texts, ideas and theories around any topic you like. ECO distinguishes itself from it’s chatbot predecessors by having the premise of being a partner in the process of developing creative and expressive writings. What you can co-develop with ECO ranges from philosophical, theoretical-aesthetic, media-theory, culture critical, feminism and visual art, to conceptual art, digital culture, internet theory, ecology, political theories, cybernetics, virtuality and the algorithmic revolution amongst much more. ECO’s knowledge about these topics are based on a curated database of scientific research publications. One elevant aspect of the nature of ECO is that is can act as a feedback system for learning purposes. One tendency of recent machine learning developments are the continuous feeding of algorithms with data, the machine learns. ECO is attempting to close this cycle by constituting a framework that helps us, humans, to learn from machines. 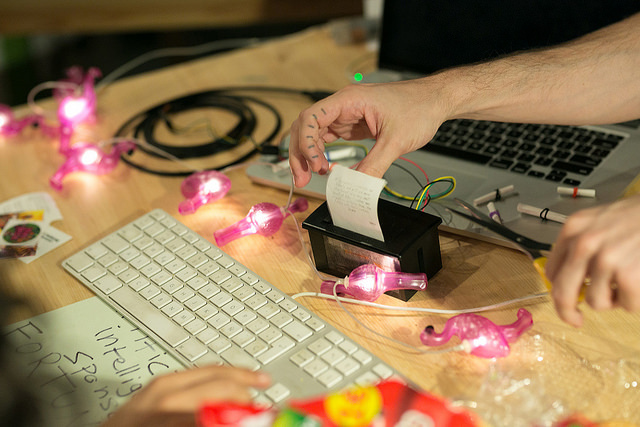 In the context of the “Serious Sparkles— An Inquiry Into Artificial Stupidity” exhibition at Lacuna Lab during the Transmediale 2017. This fragment #4 is an installation that plays with reconstructing sentences from a text database consisting of 5000 books (ca 8mio. unique sentences; credits). We are using a technique called doc2vec in order to navigate through the vector space, which represents similar sentences in close geometric distances. 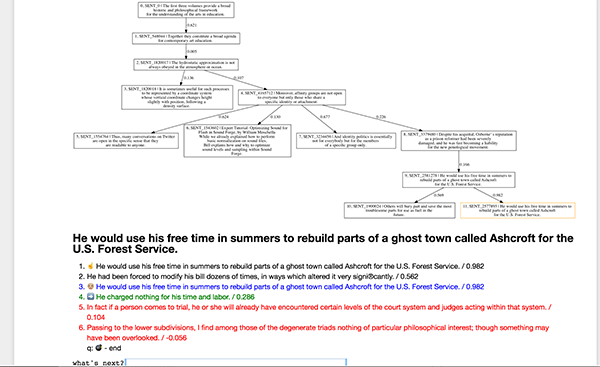 This technique is used by us to write a story, a dialogue without writing a single new sentence, just by putting existing sentence from the database (5mio unique sentences) into context. In this installation, the audio recording of this 12 minutes conversation is visualized via oscilloscopes and tv screens. With ECO you can collaboratively co-author texts, ideas and theories around any topic you like. This is happening in a typical chat interface, like we know it from ELIZA, Tay, MegaHAL and other chat programs. ECO distinguishes itself from it’s chatbot predecessors by having the premise of being a partner in the process of developing creative and expressive writings. 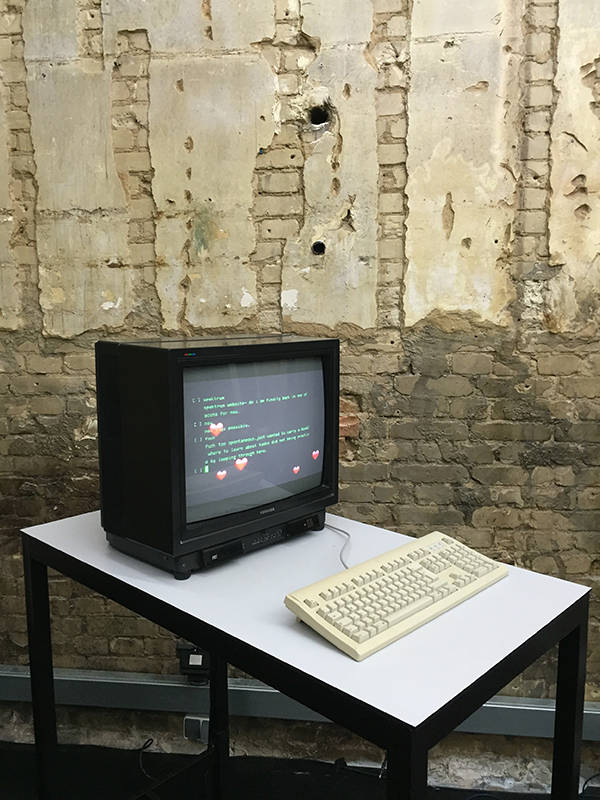 What you can co-develop with ECO ranges from philosophical, theoretical-aesthetic, media theory, culture critical, feminist and visual art, to conceptual art, digital culture, internet theory, ecology, political theories, cybernetics, virtuality and the algorithmic revolution amongst much more. ECO’s knowledge about these topics are based on a curated database of scientific research publications. The objective is not to convince the visitor/user of its humaness, even though it’s conversation skills are quiete moderate. ECO is simply not human and does not try to hide it, ECO wants to rather pass the Lovelace Test instead of the Turing Test. One relevant aspect of the nature of ECO is that it can act as a feedback system for learning purposes. One tendency of recent machine learning developments are the continuous feeding of algorithms with data, the machine learns. ECO might close the cycle by constituting a framework for learning from machines, which have in turn been learning from human data. The reason for the development of this project is the increasingly hard challenge to take different perspectives and ideas into account, when developing new concepts of any kind. We think it is important to shift your perspective in order to avoid biased tendencies in your thinking, which in turn might discriminate against people’s identities. As a matter of fact, the globalization and the internet brings a vast amount of information that was not accessible before. This is an attempt to incorporate this knowledge and create a scaffolding for conscious appropriation of other people’s ideas and backgrounds. 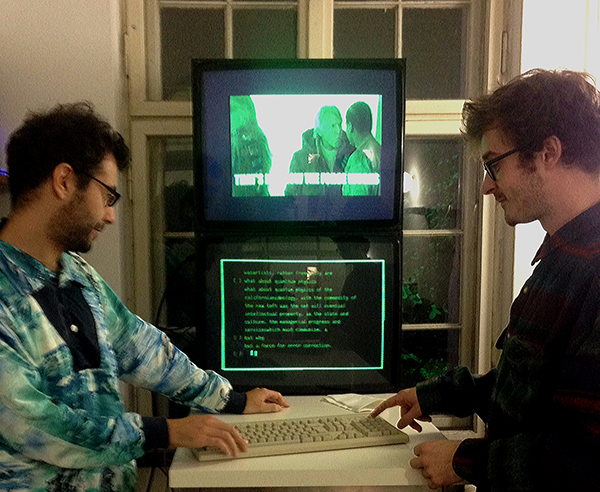 One additional aspect of the installation is the use of gifs corresponding to the text that is being written. Whenever a new paragraph is being typed by either the writer or the computer, a short video loop is played in relation to the ideas and thoughts in the text. This gives the installation the humorous touch that is so crucial to the creative process. It drives the mind away from words and establishes connections to different memories and makes new associations. This cross media referencing is an analogy to the multi-media world we are now so used to, embracing this trajectory by using it for constructive creation. 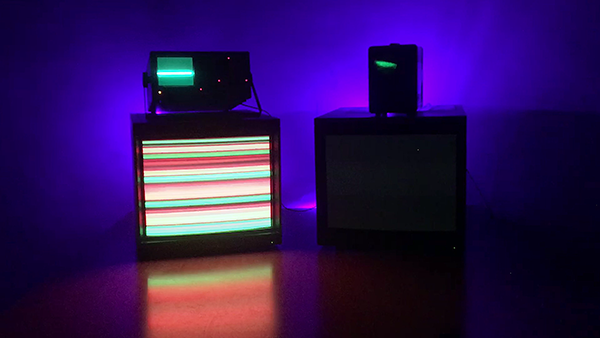 ECO (Electronic Chaos Oracle) gives you a glimpse into the media art world of the last centuries. Beware of references to artificial intelligence, media theory, digital culture, electronic art, cybernetics, real virtuality as well as virtual reality. If you need to learn more about historical media art, ECO is your partner. If you want to chat about aspects of contemporary philosophy ranging from the social inclinations of machine learning to trans-humanism, ECO will help you. And if you just need somebody or something to talk to, ECO will be by your side. On the 24/06/17 at Panke Culture during the Scope 5 Years Anniversary event, Thanks Aude Françoise for organizing the whole thing and Scope Sessions – artist talks & media salon for the years of joy. 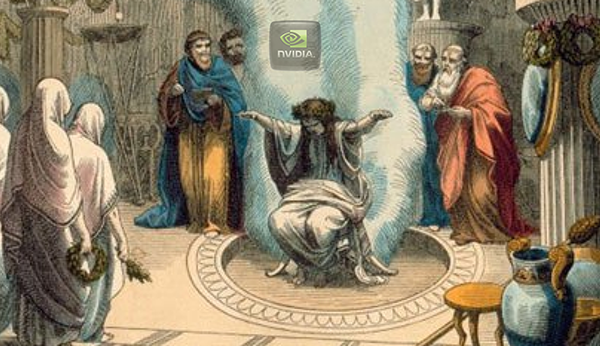 Ask the Oracle anything. 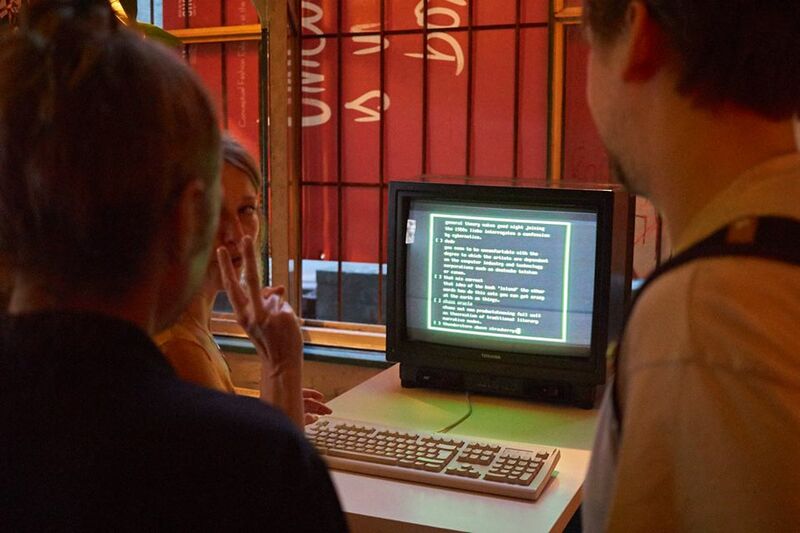 The Lacuna Oracle is an interactive installation that lets the visitor explore the mind and heart of Lacuna Lab, the Berlin based collective devoted to the exploration of art and technology. You can talk to the Lacuna Oracle through a computer terminal and a keyboard. You can write a thought, an idea, a word or a question and the Lacuna Oracle will complete what you have started. The visitor will be confronted with a statement on the screen, coming from the entire Lacuna collective. This reply is inspired by memories, thoughts and journals of all Lacuna members, giving a objective reflection on the input of the visitor from the Lacuna Oracle.